Cedar Fair is really out to spend money this season. 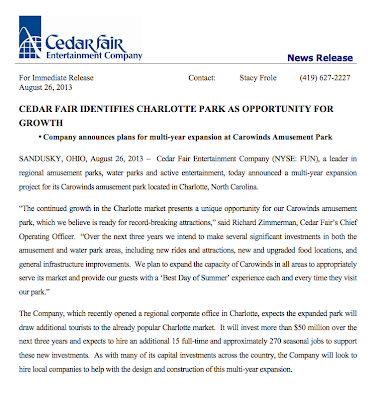 On August 26th, Cedar Fair announced that over the next three years they will be investing more than $50 million dollars into their Carowinds park, a former paramount property. This is a long needed growth for the park which hasn't seen nearly as much attention as it's other sister properties. The investment project is to last over the next three years. -Significant investments in both the Carowinds park and their waterpark Booomerang Bay in the form of new attractions and ungraded infrastructure improvements and upgraded food locations. 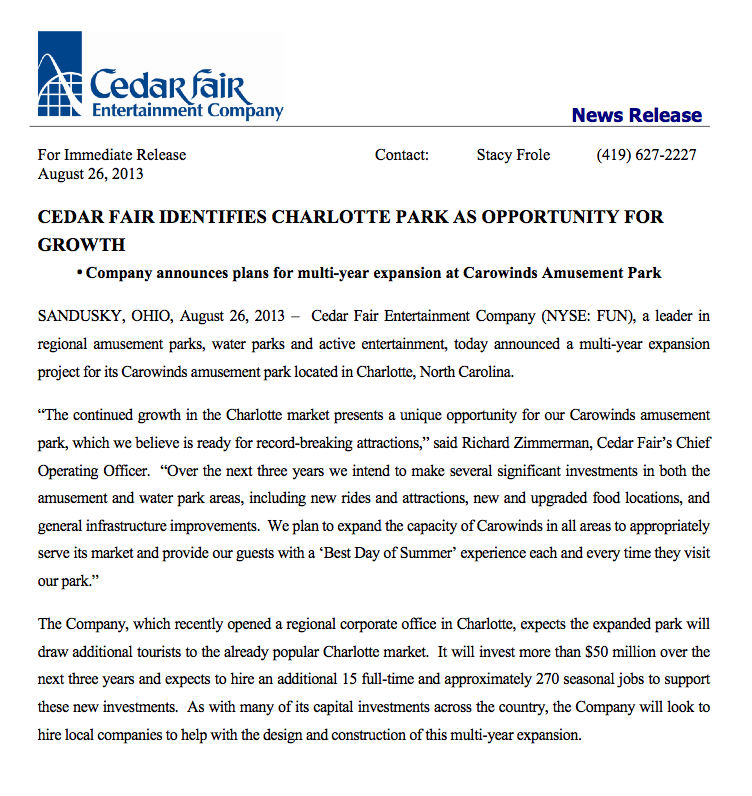 -A new 'satellite' corporate office for Cedar Fair in Charlotte, North Carolina. Rumor is also saying that this large investment could see the acquisition of new land for the Carowinds park. Screamscape is reporting this 61 acre area could even be a new resort hotel for the park. While all of this is excellent news for the park, the downside for this rumor is that $50 million doesn't buy a lot of new attractions of the roller coaster variety. Carowinds hasn't seen a new coaster added to their pack since 2010 when they received a scaled down version of Intimidator.